Outdoor Automated Teller Machine support page for first time buyers. How much does an outdoor ATM cost? Our least expensive model is under $5000. Please call, sales events are unannounced. Do I keep all of the surcharge money collected from my machine? You get all of the surcharge fees that you place on your machine. It’s your machine. Some people selling ATM’s try and get their customers to give them 50 cents a transaction. With us, you keep that. Oh, and we return the vault cash taken out, in only 48 hours, right into your bank account. We send you all of your surcharge money monthly. Who provides the money for an Outdoor ATM? How much vault cash should I put into the Outdoor ATM? Try $3000-$5000 at first until you see how fast this is withdrawn. Some machines hold $20,000 or more, and some financial institutions prefer to fill up the machine to capacity. How much are monthly fees for Outdoor ATM processing? There are $2 -$3 of data charges monthly depending on the amount of reports being ran at the ATM. There is a $10 monthly network access fee that includes all support and online ATM reporting. Most ATM’s have a 1 year warranty and 90 days labor. Nautilus Hyosung has an extended warranty program. Usually the first roll of ATM paper comes with the outdoor cash you purchase. Sometimes this is a starter roll. We also send you an extra roll within the first week or two that the machine is operating so a backup is ready for installation. When the second roll is installed, call us, or call our paper supplier directly and purchase additional rolls at the same amount that we pay for it. Do Outdoor ATM’s need programmed like Indoor ATM’s? Yes, outdoor cash machines need programmed with terminal ID information, master encryption keys, and receipt information. Some ATM cash machines are programmed with this information before it leaves the factory. Some banks and financial institutions will require a technician to come and program the ATM on location after it is mounted in a walk up or drive up configuration. Yes, we can get ATM’s delivered to every state in the US. Shipping can be anywhere from free to $100 and up to about $350 in remote locations. It all depends where the machine will be located and how remote your location is. Outdoor ATM cash machines are heavier than stand up machines. Therefore shipping is higher. Also, any upgrades in cash dispensers, vault design, and vault access can add the overall weight of the outdoor machine and will carry a higher shipping charge. How do I get service for my Outdoor ATM? What if my ATM breaks? Service is available nationwide through OutdoorATM.com There is a large network of ATM techs across the country that are ready to be deployed in case of an ATM needing repair. In reality, the ATM’s we sell at OutdoorATM.com rarely break down. And today’s ATM is designed to be service friendly. In some cases a part can be simply taken out and replaced very easily. The ATM owner can make most repairs themselves this way, and can save service call fees. What if I don’t want to buy an Outdoor ATM but I need one in my business? It depends on the location, but generally it is difficult to get an Outdoor ATM placed. First of all a hole must be cut in the wall. Or an outdoor kiosk must be installed to accommodate the ATM. This can be costly and usually prevents most companies from placing outdoor ATM’s in other businesses. Contact us to see if your ATM location warrants an Outdoor placement. What if I already have a processor? Can I buy an Outdoor ATM and have it processed by another company? Our machines are priced low for a reason. We price them near wholesale and recoup any profit from ATM networks over time. For it to be profitable for us, it takes two or three years of processing your ATM. .
Can Outdoor ATM’s conduct after hours deposits? Contact us for availability of ATMs that have deposit options. Foreign cards work in our outdoor ATM’s, however foreign credit cards cannot be surcharged. If a foreign credit card is used in your automated teller machine you will not receive your normal $1.50 or $2.00 surcharge for that transaction. These cards are considered surcharge free. There are a few exceptions beginning to emerge. Keep checking back with OutdoorATM.com and we will update this information when we get the latest information. Is there a limit to how much can be taken out of the machine? Can a limit be set at $100? What is the difference between a Weatherproof ATM, a Weather resistant ATM and a Weatherized ATM? A weatherproof ATM and a weatherized ATM are basically interchangeable terms. They are made to withstand the effects of weather. A weather resistant ATM is not as suited for outdoor use as a weatherproof ATM is. Weather resistant ATM’s should be protected by some kind of overhang or awning. All outdoor ATM’s should be temperature protected though. Unless you live in a state like Southern California, or Hawaii, where temperatures stay in normal operating ranges. Do you sell ATM kiosks for outdoor use? Yes we do. 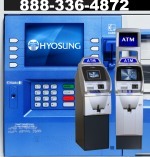 ATM kiosks are built by various companies for certain models of outdoor ATM cash machines. Call or contact us for pricing and availability. Some outdoor kiosks are heated and cooled to maintain an ATM within it’s operating ranges. Outdoor ATM kiosks are not inexpensive. They have to be made strong and durable to withstand the rigors of use and the outdoor elements. What if I need an indoor cash machine for my location? Do you sell Mini-ATMs? Visit IndoorATM.com for retail ATM deployment applications .